If you're looking for economical Power Mobility that's dependable and performs as you would expect it to, then the Sport 2 is a great way to get around. It's front-wheel drive system provides smooth, maneuverable handling up to 4 MPH. With a 23" overall width you'll be able to easily pass through doorways and tight hallways. The tight turning radius of 25" allows rotating in-place. 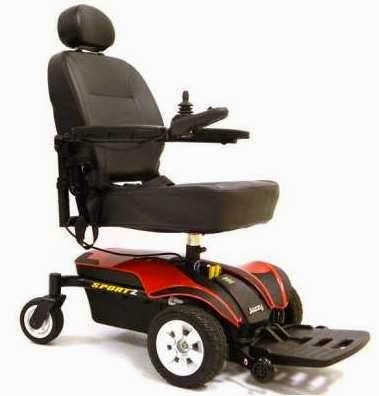 The Sport 2 uses U1 batteries for a reasonable driving rage of 9 miles, and the chair easily cruises at a good pace with superior steering and handling. Comfortable Seating. The Sport 2 includes a High-Back Seat with Adjustable Headrest. The back offers a limited recline so it can be set for your best comfort. See the full description, specifications and options for the Jazzy Sport 2 on our website. At $1699 delivered and set-up, the Sport 2 is a great buy!